Chaffey's Court was a pair of dwellings, enclosed behind houses on the north side of Park Street some 30 yards or so west of the Swan Inn (now the Swan Theatre and marked P.H. on the map below). It was entered via an alleyway between the Park Street houses. Chaffey's Court was not entered separately on any census, but the occupants of the dwellings were simply enumerated in Park Street generally. 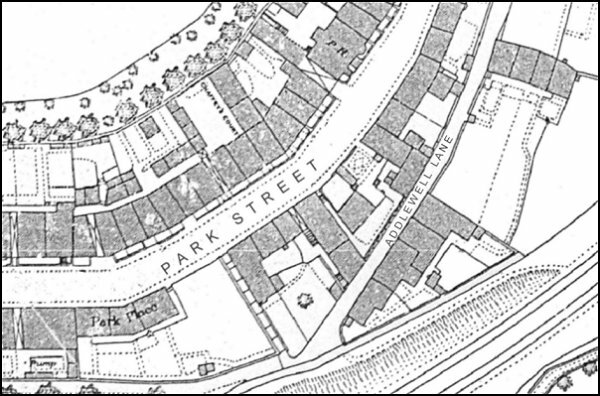 The 1886 Ordnance Survey showing Chaffey's Court, left of top centre, set behind houses in Park Street and entered through a covered passageway seen just above the 'S' in Park Street.